eu não entendi como faz esse mod rodar, alguem me ajuda? put the VoxelMap riftmod .jar in your .minecraft/mods folder. Can the map be exported to an image file or viewed in a web browser? Hello, I really like this mod. However, I run a server and I don't want my players to use certain features of it, primarily the entity radar and caves view. Is there a way I can forcibly disable this from the server-side? (Such as with a bukkit plugin, like Journeymap once allowed). Edit: it'd also be really great if there were a bukkit plugin that could automatically handle multiworld stuff as well. There was a plugin like this for journeymap and I miss it dearly. i got the format error when i'm deleting a waypoint. and i also fixed the lang messages for ja_jp. replace it if you would like. Liteloader isn't on 1.13 yet either, is the big issue. Also, sadly it seems forge and rift for 1.13+ can not both be installed onto the same profile like you could with 1.12 forge and liteloader (or at least they have not released instructions on how that could be done and I have tried everything I could think of). So, now for 1.13+ I am stuck choosing between using forge which is compatible with most of my other mods (this is the only mod that needs rift still) or using rift with the small number of mods it is compatible with (seems more mods for forge being released daily and rift mods being updated to work with it all the time as well). Worse yet is it seems the person who originally created rift has been away for awhile or possibly abbondoned the project. So the rift for 1.13.2 is done by a new person. Just click the liteloader link and download the installer for the version you want the mod for. After that, run the installer and make sure it extracts to your .minecraft folder. Not every mod needs to be for forge to work. About 1.13, apologies, I somewhat assumed you'd be on 12.2. And remember to install liteloader as a .jar (Forge mod). Help! This conflicts with Realms. Maps created on a Realms server will constantly be reset. I think it might be because a Realms world doesn't always keep the same server address. Even if the map stays the same and no changes are made, it can go from "3-81-70-132[...]27521" to "3-80-126-45[...]27240" to "3-80-134-175[...]27525" all on its own in the course of a day. Removed parts of the server address for anonymity reasons. 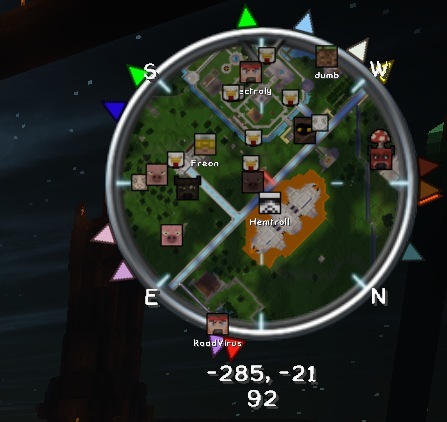 Would there be a way to force it to use the same map data for named Realms servers? Even the option to use the same map for ALL servers would be welcome, as that is the only server I use. Is there a way I can edit the icons used for entities? Many icons are way out of proportion or in some cases it's using a sheep or some type of default icon for I'm guessing a mod that doesn't have the file in there somewhere? I really want to stop jellyfish icons from taking up so much of the screen and stuff, but I can't find any reference to where its getting the icons. There's a mobs.png file, but it only shows some of the entities in the game, not all of them, and seems to be the ones that were latest used, so I don't think editing that is going to do what I want.